The website menu is used to link different sections of your site so users can easily navigate from one section to another and find the information easily. Let’s see how we can create different menus and customize the look and feel of it. Multiple menus can be created from the WordPress dashboard and each menu can be assigned to a different section of the website like the header menu, sidebar menu, footer menu and so on. Let’s take a look at creating a menu and assign it as the main menu of the theme. Step 1: Create a new menu. 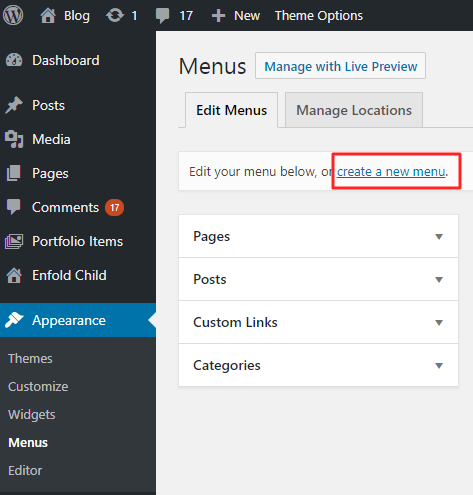 Create a new menu: Go to WordPress Dashboard > Appearance > Menu and click on create a new menu. 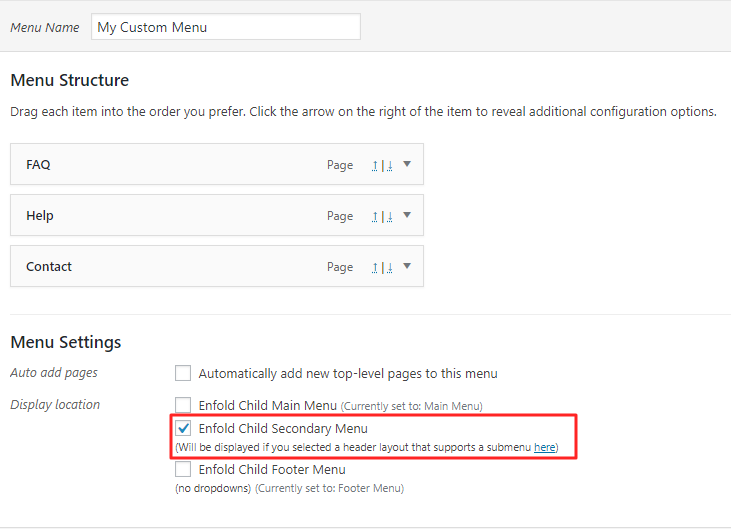 Give your menu a custom name such as “header menu” or “footer menu” so we can later assign it to different sections of the site and click on “Create Menu“. Step 2: Add Menu Items to your menu. Add Menu items: You can add any page and post types to the menu or select custom link to add an external link that is not on the list. 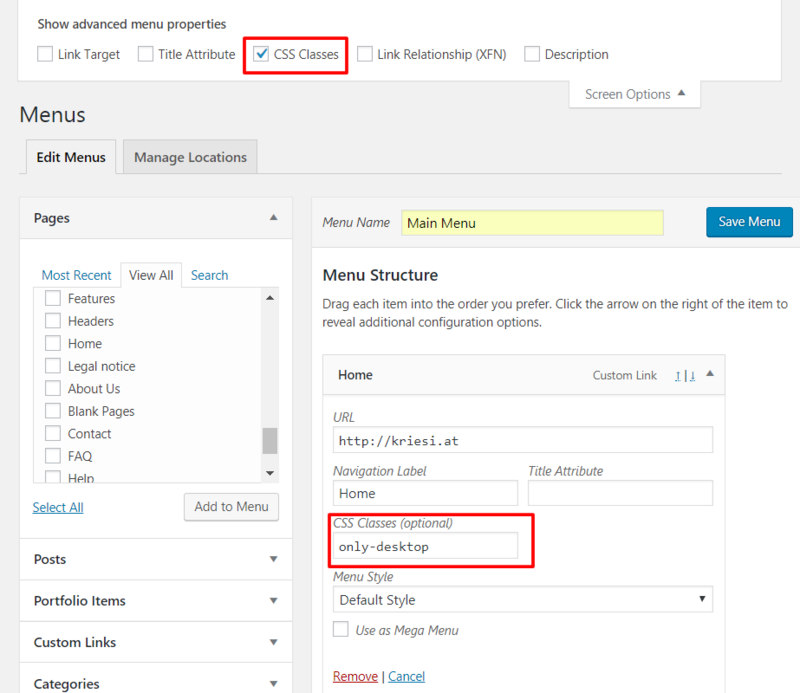 To create submenu drag the menu item below the parent and indent it as shown in the below example for the Blog. To change the order of the menu items in which they appear just drag the menu item up or down in the Menu Structure. Step 3: Assign a menu location and save. Assign and Save menu: Once the menu items are added to the Menu Structure assign the menu to the different sections of the website like the header, footer etc. and finally, don’t forget to “Save Menu“. If all the steps are successfully performed the menu should appear in the location assigned under the “Menu Settings“. Add the below CSS to your site to display the Topbar only in the mobile device. NOTE: The fonts should already be installed on your theme for the above code to work. If you have not installed the font please import the fronts from Enfold > Import/Export > Custom Font Manager or use the @import rule on top of your child theme style.css file to import the new fonts using CSS. To remove the separators copy and paste the word “transparent” in the color value field. You can add more CSS rules like the font color on hover if required. To remove the default horizontal separators and the border around the sub menu, please use the below CSS. 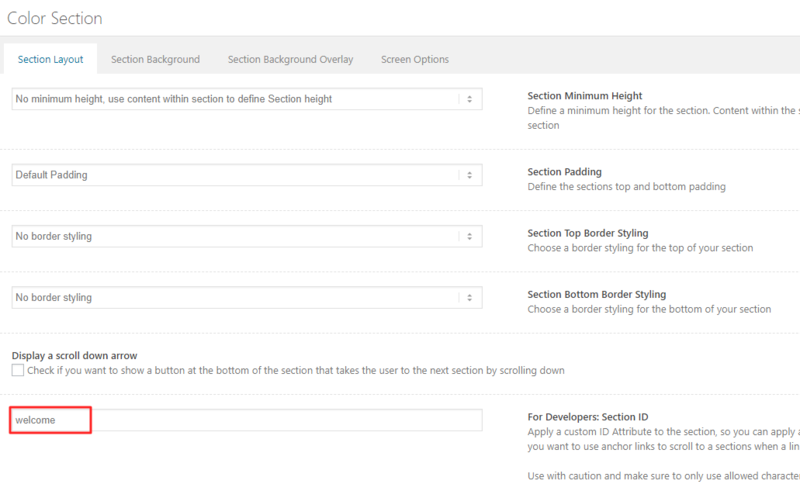 You can add your own borders styles to the same selector if required. By default, the info text inherits the style options set for the top bar menu. Drop an icon element on to an empty page with desired settings. Copy the icon shortcode from the debug window to Enfold Options > Header > Extra Elements > Phone Number or small info text and place it next to the phone number or email address as shown in the below screenshot. NOTE: To add a custom icon please check the documentation. Enable the search bar shortcode. Open a new page and drop the icon element of your choice. Change the icon size to ’20px’. If you are using multiple elements like the links, icons and search feature in the top bar please use the below CSS to line them up next to each other or else the elements may stack up. Main menu can be assigned from WordPress Dashboard > Appearance > Menu for step by step info please check the Menu Set up section. By default, the icons in the menu links will inherit the same styles applied to the menu links. 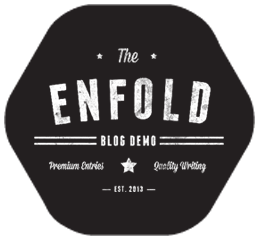 To add custom menu separator to the enfold menu please disable the default separator from Enfold > Main Menu > General > Separator between menu items and add the below custom CSS to your site. 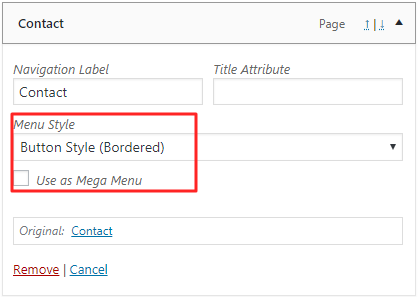 Add a border style to the main menu items from WordPress > Appearance > Menu > Main menu > Menu Item > Click the drop-down arrow to expand the options and select the “Menu Style” to be “Button Style (Bordered)”. The button style applied to the main menu item can be further customized from Enfold > Advanced styling > Main Menu > Menu Item Button with Border. Example: To add a border radius to the button so it looks like a pill. Change the value of the border-radius field. Click on the drop-down arrow to expand the menu options and look for the menu style. To remove the underline from the active menu item and also on hover please use the custom CSS below. 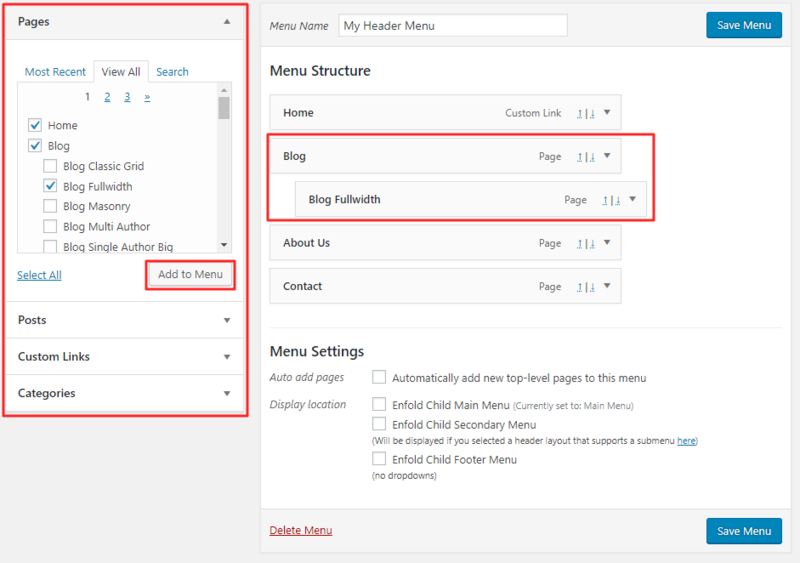 Once the text menu is set up its position in the header can be changed from Enfold > Header > Header Layout > Menu and Logo Position below are the options available to position the menu inside the header for desktop layout. To hide the main menu on the desktop, please use the below CSS. To disable the parent menu link so it cannot be clicked and show only the submenu items on hover please follow the below steps. Expand the “Custom Links” options. Create a parent menu item with its URL as “#” so it will not be clickable. Add the submenu items to the parent menu. Learn how to add a subtext to your menu items and change the font color, size and other style values using custom CSS. Step 1: Enable Subtext or Menu Description. Enable the “Description” field for the menu items from WordPress Dashboard > Appearance > Menus > Screen Options (on the top right of the page). Add the description or subtext for the menu items and click on the Save Menu button. For the vertical menu, the description should show fine by default. For the horizontal menu add the below CSS and adjust the style values to suit your design. NOTE: The fonts should already be installed and in use by any other element or use the @import rule on top of your child theme style.css file to import the new fonts using CSS. To add custom border style please use the below code in your site and adjust the values as required. To add a horizontal separator to the sublevel menu items please use the below CSS. 2. Select custom links from the menu options. 3. Add a new parent menu item in the “link text” and use ” # ” for the URL field and click on Add to menu. The menu items on the transparent header inherit the font styles of the default menu. To add custom border style only on the transparent header please use the below code and adjust the values as required. To add a horizontal separator to the sublevel menu items on a transparent header please use the below CSS. The vertical menu subtext is set up the same way as we did for the main menu subtext in the Main menu section. The Burger/Icon menu is a 3 lined icon menu. 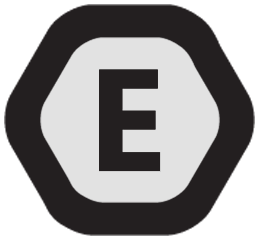 When this icon is clicked a slide menu or a fullscreen overlay menu can be activated. To activate Burger/Icon menu for desktop go to Enfold > Main menu > General > Menu Items for Desktop and select Icon menu. To activate Burger/Icon menu for Tablets or Mobile device go to Enfold > Main menu > General > Menu Items for mobile and select the viewport of your choice. To activate the burger for any custom screen width, update the max-width value in the below code. It is recommended to set the max-width value to be of the screen width just before the elements like the menu starts to run into the logo. To change the color of the burger menu on mouse hover please add the below CSS to your site.  To change the burger menu icon color when a user clicks on it and is active please use the below CSS. To change the burger menu icon to a custom fontello icon please use the below CSS. Check the Icon element documentation to know more about unicode and choose the icons of your choice for the default and active state. Replace the default burger menu icon with a custom image by changing the URL of the image in the below code and add it to your site. Replace burger icon with word "menu". Remove Separator: the separators copy and paste the word "transparent" in the color value field. To hide certain menu items on mobile, please go to Appearance > Menu and then check “Screen options” on the top right side and then check “CSS Classes”. After that, a new field will appear under your menu items. Now you can simply edit your menu items and give “only-desktop” custom class to the menu items that you would like to hide on mobile. Note: Please choose custom CSS classes that do not start with “menu-item”. These classes are not rendered to avoid conflict with main menu. To add custom color only to the submenu items please use the below code. and add the below function to your child theme functions.php file. Remove Separator: To remove the footer menu separators use the below CSS in your site. By default, footer menu is disabled on the mobile device. To display Footer menu on mobile please add the following CSS code to your site. The above now makes it so that when viewing the *portfolio* custom post type (which comes with the theme) there will be no floating navigation to the next or previous portfolio items. Take me to the Mega menu documentation. Take me to the Fullwidth submenu documentation. In the below example let's take a look at re-creating the consulting demo sections and menu. Add a unique Section ID to each section. In the below screenshot, notice we add an anchor ID called "welcome" to the welcome section. We will use this section ID later on to link the menu item and when a user clicks on the welcome menu the page will scroll to the welcome section. 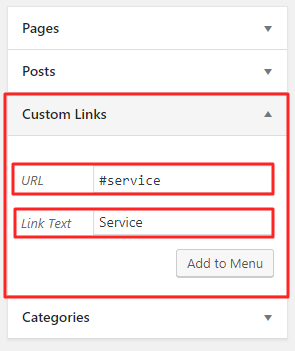 Give your menu a name and start adding custom links by clicking on the custom links options. Default menu: If your website has only one page you can simply choose the one-page menu as the main menu from WordPress > Appearance > Menu > One-Page Menu. Fullwidth submenu: To add a one-page menu on a specific page first disable the header from the page layout options and add a Fullwidth submenu element and choose the one-page menu in the options. In case you want to add the one-page menu to a specific page as the main menu please check the section different menu on different pages. Dots Menu is best suitable for one-page navigation. One page dots menu is a simple fixed menu with several dots and each dot links to a different section of the page. In this tutorial, let's take a look at modifying a "Fullwidth submenu element" to look and function like a one-page dots menu. Before we start, create a one-page menu using a Fullwidth submenu element. Enable custom CSS class name support from Enfold > Layout Builder > Developer options and give the Fullwidth Submenu a CSS class name "dots-menu". After completing the steps we should have a dots menu that looks similar to the below screenshot. If you have followed the steps correctly, you should now see a one-page dots menu that links to the different section on the same page. Menu items can be spread out to take up equal space over the entire column width as seen below. To achieve this menu layout we will use some custom CSS and specific header settings. Header settings: Enfold > Header > Header Layout > Menu and Logo Position and select Logo left, Menu right. By adding a custom CSS class name to the menu items we can target specific menu items to make changes. Step 1: Access screen options. Go to Appearance > Menu and then check “Screen options” on the top right side. Here you will notice some advanced options, go ahead and select “CSS Classes” if it is not checked. If it's already selected you do not have to do anything simply skip to the next step. After the custom class name option is enabled a new field will appear under your menu items. 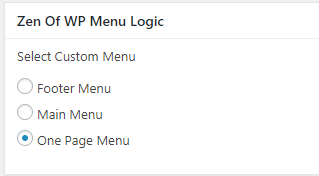 Now you can simply edit your menu items and add a custom class to any menu item so we can target it using CSS. In this tutorial, we will add custom icons to your existing menu items. Follow the simple workaround as mentioned in the below steps and at the end, your menu should look similar to the below screenshot. 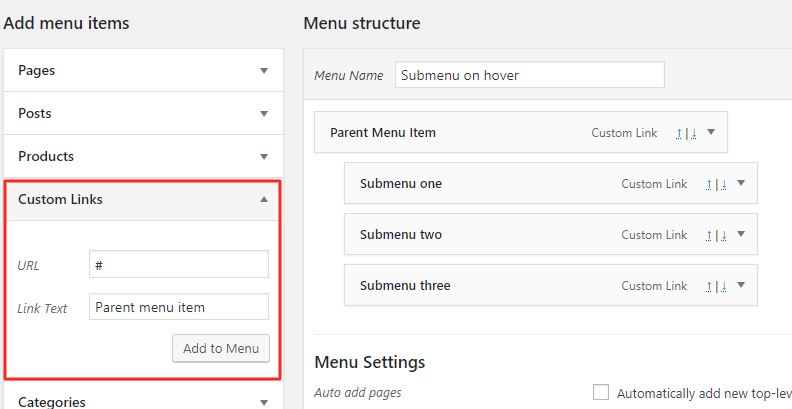 If you do not have a menu assigned to your theme yet go to WordPress Dashboard > Appearance > Menu and create a menu so we can add the icons to the menu item. For step by step instructions to set up a menu please check the Menu Setup section. The Debug mode will allow you to copy the element shortcodes. Follow the steps to Enable debug mode. So we can copy the icon shortcodes. Open a blank page and select the icon element from the Advanced Layout Builder. Make sure to set the correct icon size in icon options and copy the icon shortcode. Now, you should be able to see the icon shortcode in the debug area below. 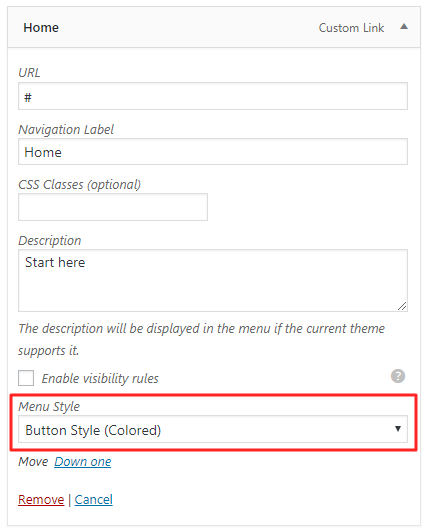 To add the icons to menu item go to WordPress Dashboard > Appearance > Menu and paste the shortcode for each menu item in the Navigation Label field. It is same as the Link Text or the menu text. In this tutorial, we will learn how to replace the default menu and display a different menu on specific pages. 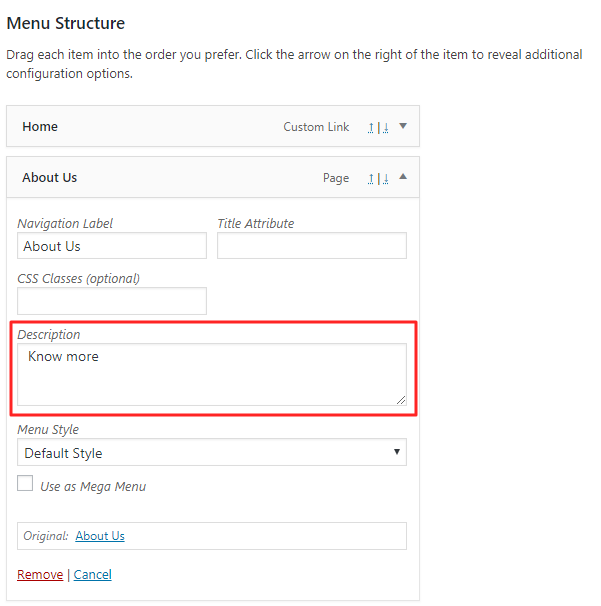 Create your additional menus from WordPress > Appearance > Menus and give each menu a unique name. To change the menu on specific pages go to the page and scroll to the bottom to view the Zen Menu options. Select the menu from the list and save the page to display the new menu. To display a different menu for logged in and logged out users please update the below code with the menu names and add it to your functions.php file. Hide top bar on mobile and display the top bar menu in burger menu. Step 1: Hide top bar on mobile. Add the below CSS to your site to hide the top bar menu on mobile. Note: To hide the top bar on tablets please change the "max-width" value to 990px. On the mobile, we want to display the main menu items and the top bar menu items. Let's combine both the menu items and create a new menu which we can display to the mobile menu. Go to Appearance > Menu > Create a new menu and give it a name "mobile menu" and add all of the above menu items. Depending on your menu item quantity and logo size, your menu items may start to overlap the logo as seen in the below screenshot. Adapt position to width: Place the logo and the menu on the left and right edge of the header so they adapt to the browser width. If the menu runs in the logo on tablets only, please enable burger menu on tablets from Enfold options > Main Menu > General > Menu Items for mobile. To switch to a burger menu on desktop go to Enfold options > Main Menu > General > Menu Items for desktop > Display as Icon. Reduce the space between the menu items. Some users will experience a limit to the number of items they can add to their menu. Unfortunately, this manifests as all menu items after the first X (X may be 16, 72, 270, or any number), and the rest will be lost. General rule of thumb is: the higher the number in the setting, the more menu items you can create.